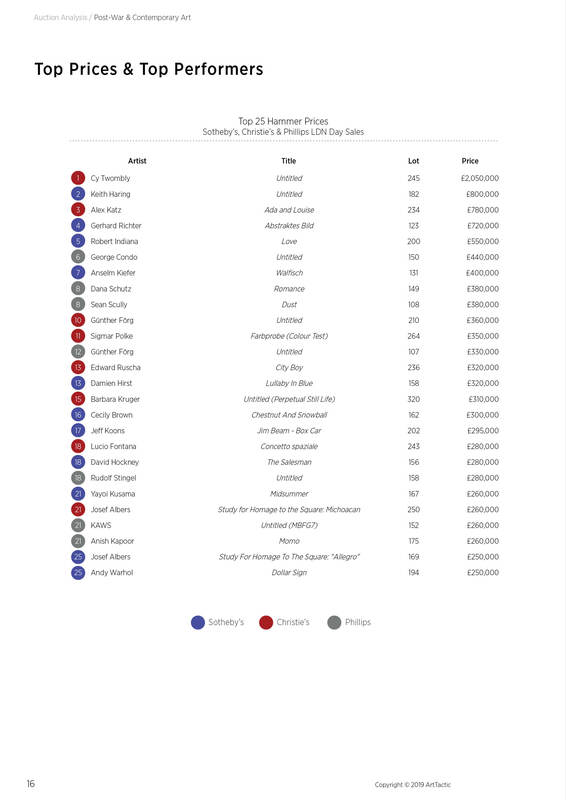 This report presents an in-depth comparative analysis of the Post-War and Contemporary art day sales at Sotheby’s, Christie’s and Phillips in London in March 2019. The analysis also provides analytical tools looking at annual sales trends between 2012 and 2019. In this edition of the London Contemporary Art Day Sales analysis, we take a particular look at artists aged 45 and below. Who are the younger artists currently trending in the day auctions and how does this compare to 12 months ago? Who are the rising stars this season? This report is popular among dealers, auction houses and collectors, who want to get an in-depth understanding of auction trends in the post-war & contemporary art auction market and follow the performance of the two top auction houses this year. 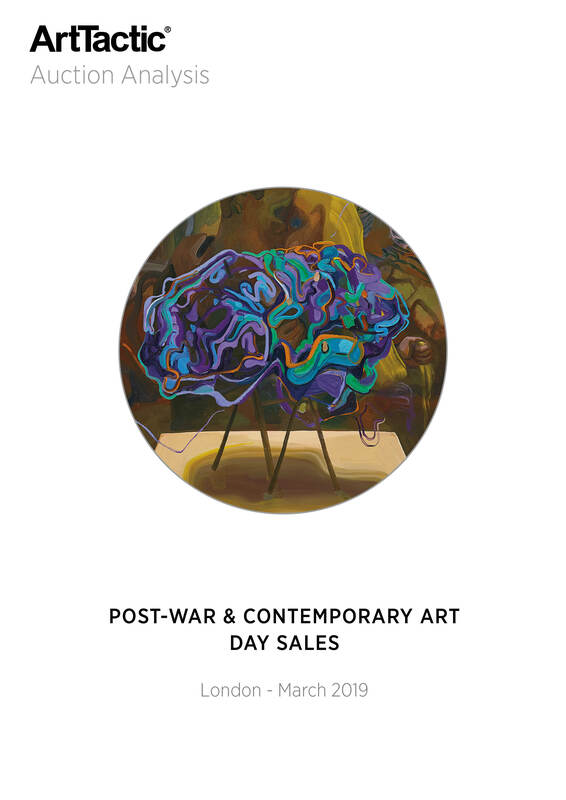 Post-War and Contemporary sales down 25.1% from March 2018: Total day sales for Sotheby’s, Christie’s and Phillips came in 25.1% lower than March 2018. Younger generation of artists see 45% decrease in sales in March 2019: Whilst the overall day sales season fell 25% year-on-year, the decline in sales was significantly higher (45%) among the younger generation of artists, which raised £2.61 million last week compared to £4.72 million in March 2018. As the art market is facing more uncertainty, it looks like the auctions have taken a more conservative approach regarding their choice of artists. What could this mean for the visibility of younger artists this year? Female artists account for 22% of sales value among artists under the age of 45 years old. Dana Schutz achieved the highest price during day sales last week, and was the only female artists featuring in the Top 10 list. The share of female artists was higher this season compared to March 2018, where female artists accounted for 15% of total sales among this generation of artists. However, it still shows that young female artists continue to struggle for equality in the auction market, even at this early stage of their career. For more analysis of the next generation of international artists, see also our Top Artists Report 2018 and Artist Confidence Report – Oct 2018. Both reports are part of our Analyst Pro Membership (£99.50 per month). Although female artists were under-represented compared to their male counterparts, the top three surprise results (hammer price compared to pre-sale estimate) were achieved by Shara Hughes (US), Katrin Fridriks (Iceland) and Nina Chanel Abney (US).